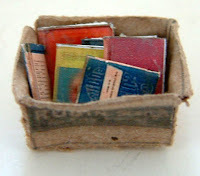 In Celebration Of One Whole Year Of Blogging - Win A Gift From KT Miniatures! 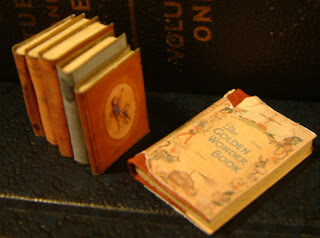 I would like to extend a very warm welcome to those of you who have become new "Followers" to KT Miniatures Journal in the past few days. 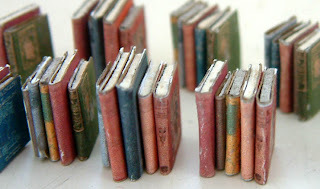 It is hard to believe that I have now been "blogging" for an entire year, so how ironic it should be to suddenly discover that there are now over 100 of you who have kindly decided to follow the musings of KT Miniatures Journal! "What do you like most about KT Miniatures website?" Please leave your answer in the comments section below. The closing date will be April 10th and then on that day with the help of "Mr KT Miniatures" we will choose a winner - ie. the answer we like the best! I will announce the winner on here as soon as humanly possible after that day and then will contact the winner by email. It is open to absoutely everyone wherever or whoever you may be. Good luck and am looking forward to hearing from you! 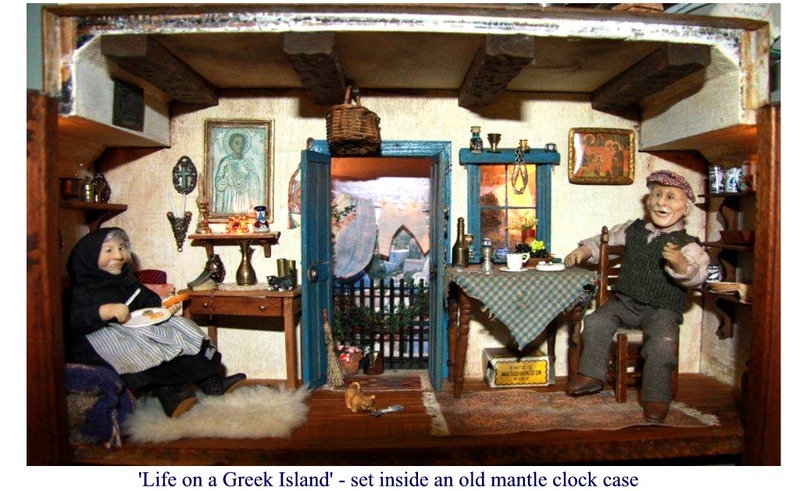 Hazel's World Of Miniatures - New Little Miniature Museum! 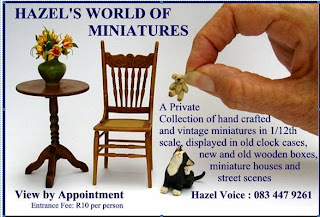 I would like to introduce you to a lovely lady called Hazel Voice who I have corresponded with for quite a while now and who has just informed me of the wonderful news that she has at long last fulfilled a dream of opening her own little miniature museum where she lives in South Africa. Hazel opened the doors to "Hazels's World Of Miniatures" for the first time last Friday and is thrilled. 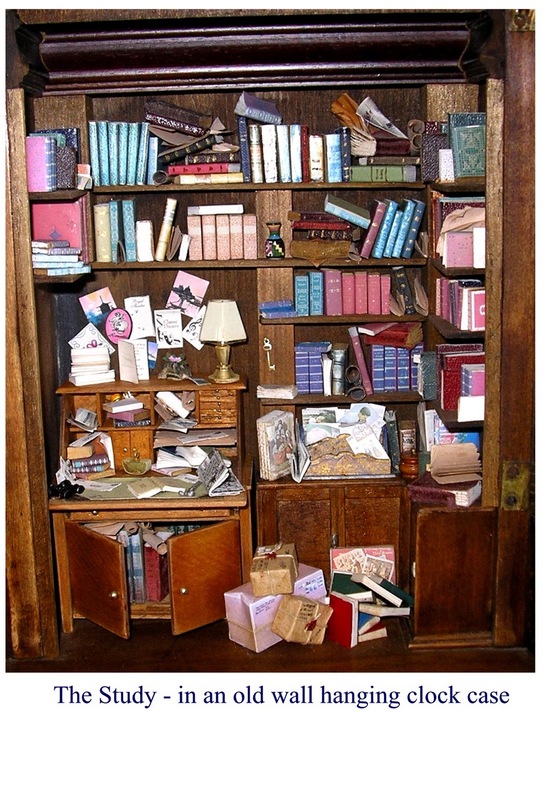 Hazel says, "After making and collecting miniatures for the last 20 odd years, I have ended up with quite a large collection. When I was given a collection of vintage miniatures, my dream of having a little miniature museum had to become a reality. I sat on the idea for several years until I discovered KT Miniatures site and realized that my vintage miniatures are way too precious to be stuck in a cupboard. 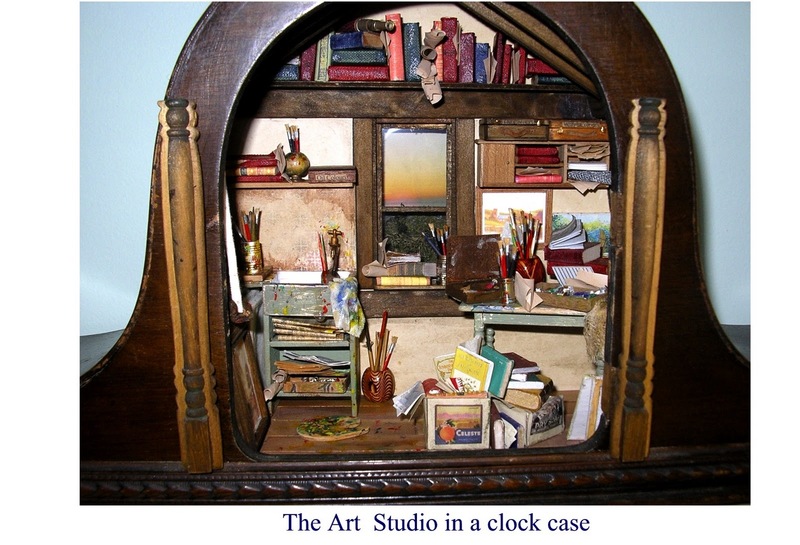 I love the challenge of creating scenes in awkward spaces, hence most of my work is set in old mantle clock cases, hat and cigar boxes – in fact anything that is unusual. I managed to persuade my husband into converting our little flatlet and the reality of ‘Hazel’s World of Miniatures’ now nestles in a sub tropical garden in Ramsgate on the South Coast of KwaZulu Natal, South Africa. 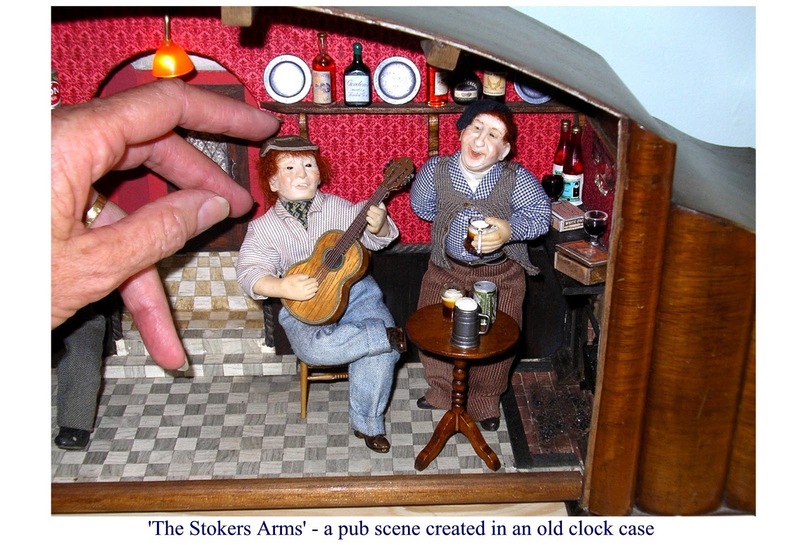 On show is a collection of hand crafted miniature scenes in the 1/12th scale, displayed in old clock cases and an array of old and new boxes, miniature houses and street scenes. Also displayed are some very rare and beautiful vintage miniatures made by Tri-ang, Pit-a-Pat, Barrett & Son and the like." I am sure you will join me in wishing Hazel the very best of luck with her new venture and if anyone is lucky enough to either live or visit Hazel's part of the world, do go check out her museum. SOME VERY SPECIAL OFFERS ON SELECTED VINTAGE DOLLS HOUSES - in celebration of Mothers Day! 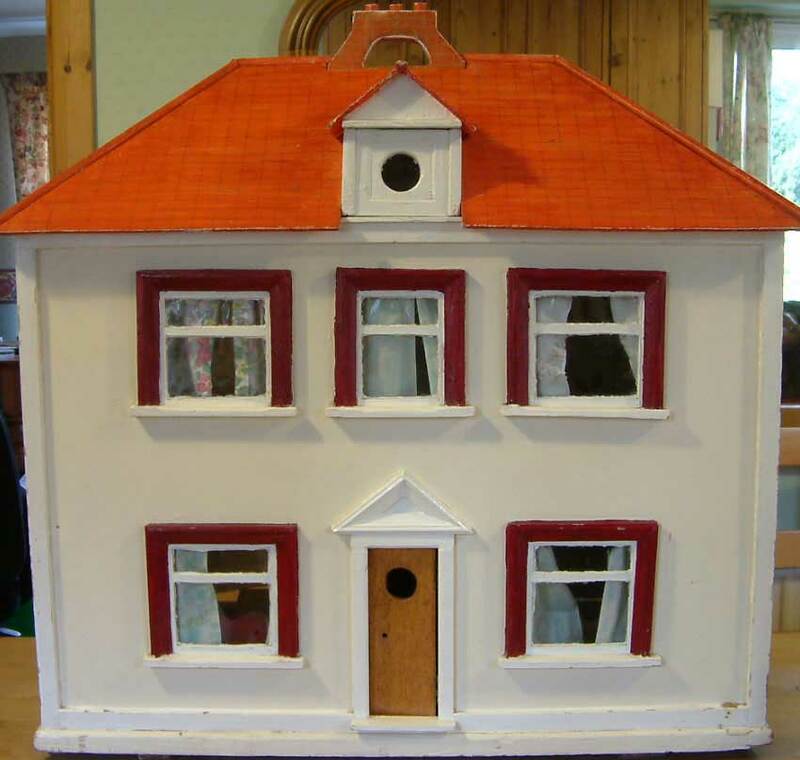 In celebration of Mothers Day I am offering huge reductions off three vintage dolls houses that are currently up for sale. SPECIAL OFFER FOR THIS RARE TRI-ANG C BUNGALOW - SAVE £55.00 - NOW ONLY£135.00 IF PURCHASED BETWEEN NOW & 2nd APRIL 2011. Must be collected in person from me here in Thame, Oxfordshire by 2nd April and payment in cash on collection or paid online via Google Checkout before collection, in order for special offer price to apply. SPECIAL OFFER FOR THIS 1950s HOUSE - SAVE £40.00 - NOW ONLY£120.00 IF PURCHASED BETWEEN NOW & 2nd APRIL 2011. 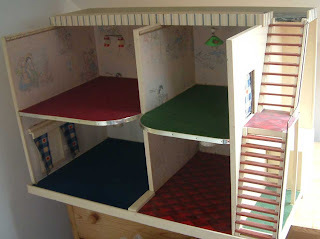 SPECIAL OFFER FOR THIS 1950s OPEN PLAN GERMAN HOUSE - SAVE £30.00 - NOW ONLY£40.00 IF PURCHASED BETWEEN NOW & 2nd APRIL 2011. 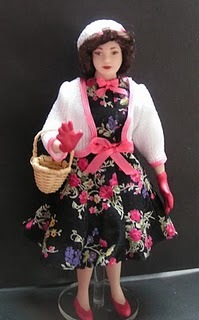 CLICK HERE TO VIEW FULL INFO ABOUT THESE SPECIAL MOTHERS DAY OFFERS FROM KTMINIATURES! Any item that is part of this special offer, if not sold by April 2nd, will be re-listed back up at original listed price .........so some real bargains to be had over the next few days....not to be missed! 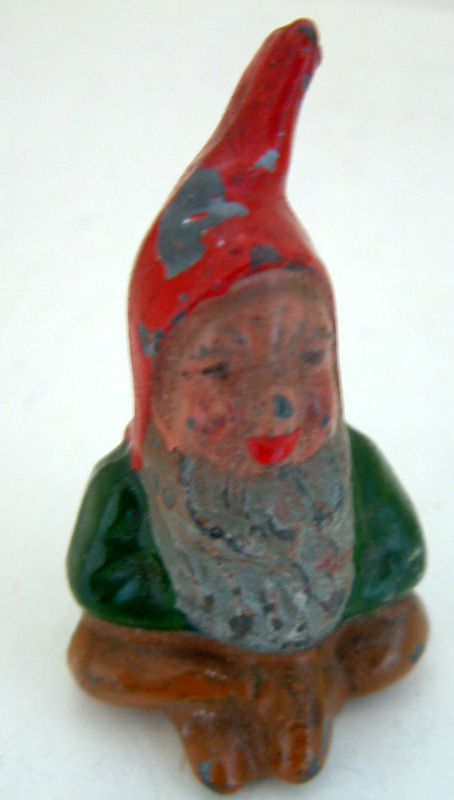 Circa 1930s Britains Rare Gnomes - what fine-looking chaps! 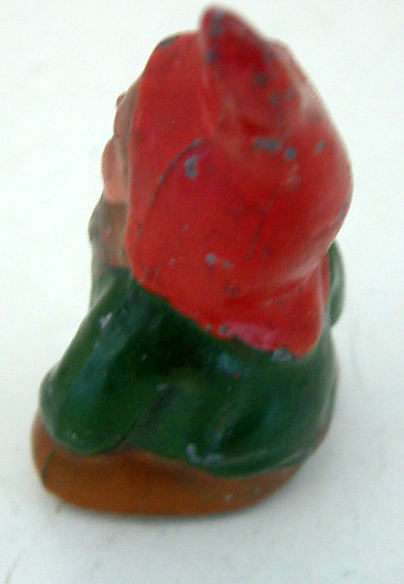 Ok...a few weeks back, I promised to bring you news of my efforts if I was successful in identifying some old painted lead gnomes that came along with what I nicknamed "The Builders Collection". 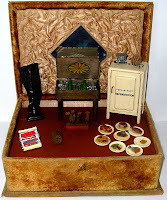 "The Builders Collection" was a box of some fantastic old dolls house treasures, all from the 1930s and early wartime 1940s, found by a builder in an old loft that was being renovated. 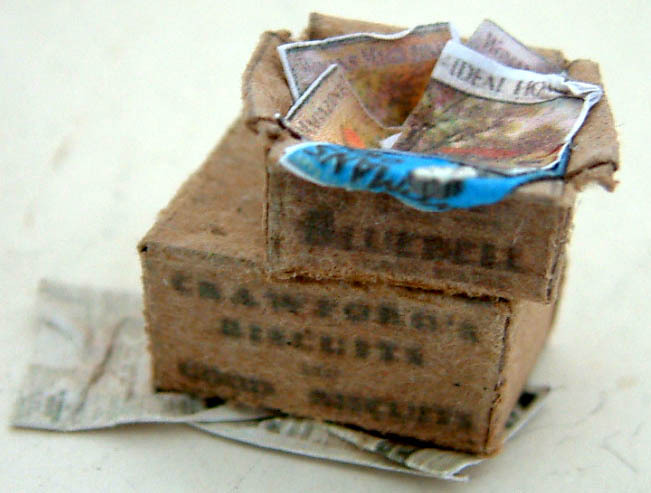 He had thought that the box was a pile of old rubbish and the whole lot had been destined for the skip until he spotted some "Pit-a-Pat" labels underneath various pieces of furniture; he gave me a ring and the rest is history....as they say! On the lying down gnome I could just make out the remnants of some makers mark but sadly was illegible. So I had to embark on a bit of research. 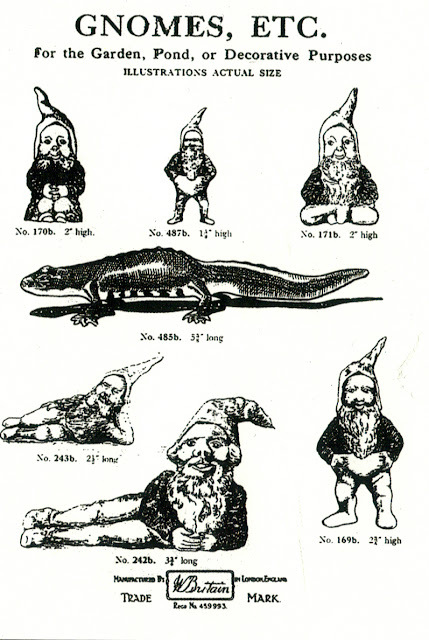 It did take some time but then I finally stumbled across this wonderful old Britains advert....and success.....discovered that they are in fact 1930s Britains lead painted gnomes and quite rare!!! Not being a particular gnome lover, I have surprised myself how I have fallen in love with these rather fine-looking chaps. I am intrigued though...it says in the advert that these are for the pond or decorative purposes. They are far too big a scale to be used with the Britains Lead Garden pieces which are 1/32 scale.... so am assuming that as the advert says, that these are meant to be used outside with "real life sized ponds"!? 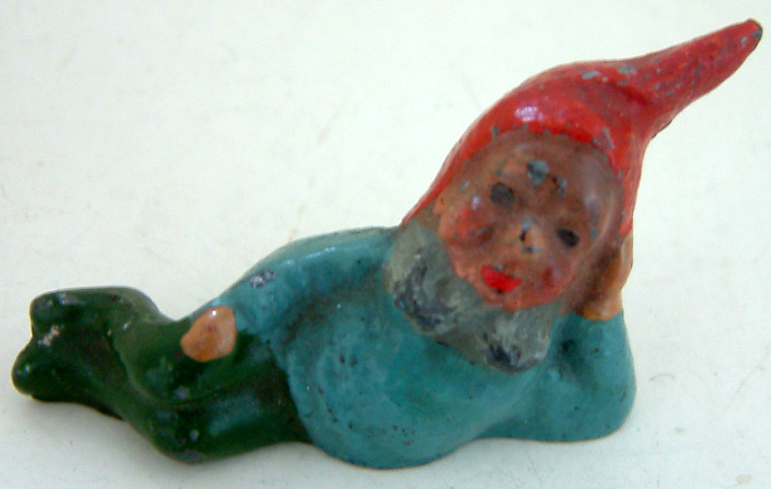 The gnome lying down measures 2 1/2" in length and the sitting gnome measures 2" high. They are solid lead so would stand up to the elements to a certain extent but would not recommend them for outside use these days as I understand that these are now deemed quite rare and valuable. 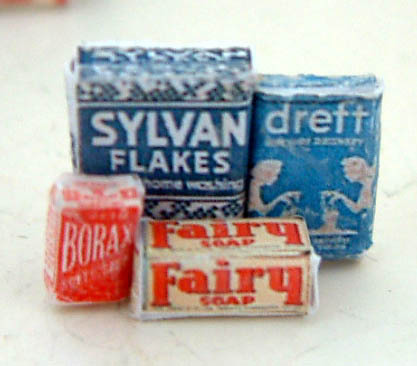 Instead I would use them to adorn an old dolls house where scale does not matter. How fabulous these could look sitting outside the front of a dolls house or by the back door! 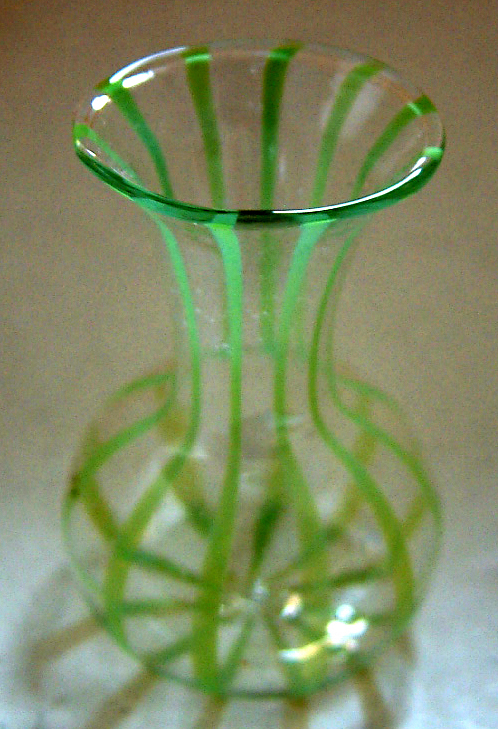 This afternoon I have just listed for sale these absolutely gorgeous antique glass striped vases. 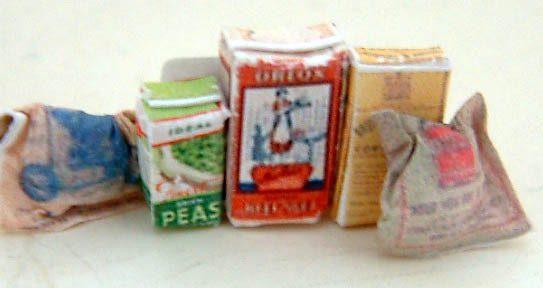 There are six of them which all came along wrapped up in a box and are believed to be old shop stock. They are in excellent condition having never been played with, which in a way is quite sad, as all their long life they have been stuck away in a dusty old box totally unloved! 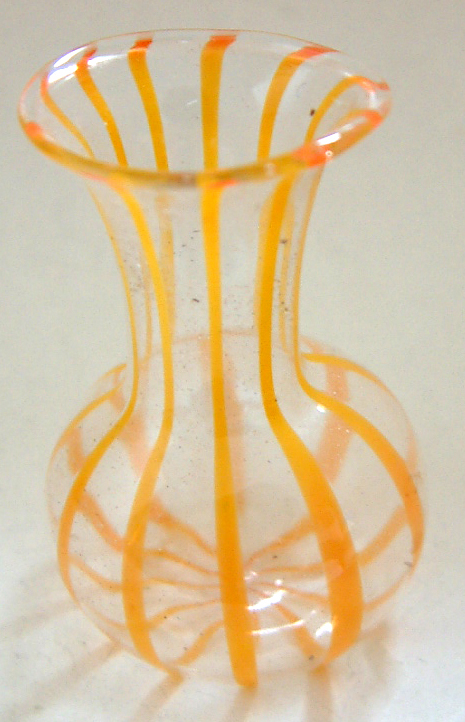 It is quite rare to find old glassware in such wonderful unused condition. There are three colours -orange, green and red. I have to say though, that although I have listed these for sale under the Antique 1/12th General section, these are most definitely not 1/12th scale but larger. 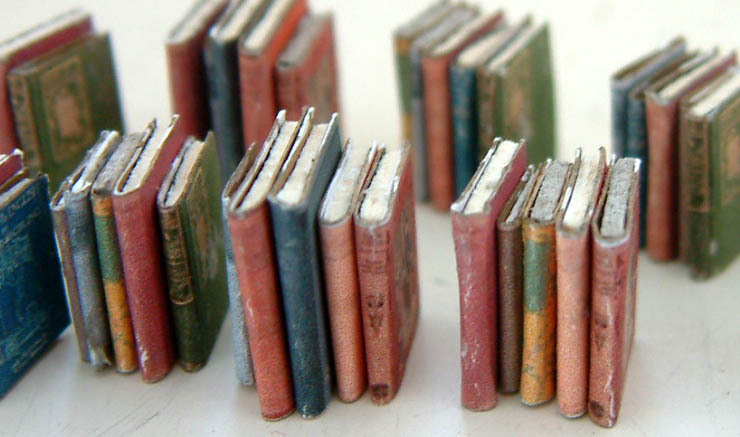 They stand at just under 2" high and are 11/4" in diameter at their widest point. 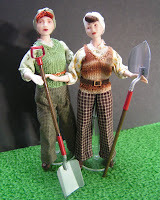 I had been tempted to list them under the larger scale section on KT Miniatures but then decided that these could look fabulous in an antique dolls house where scale is irrelevant. 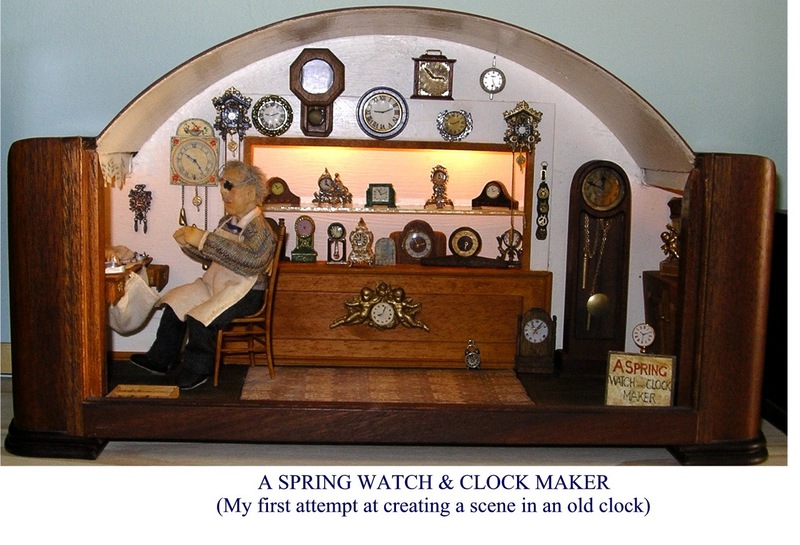 New Slideshow For KT Miniatures & A Spot Of Early Cyber Spring Cleaning! Today I embarked on a bit of early cyber spring cleaning and been tidying up a few loose ends on my Home Page. I also wanted to create something that would show customers some of the diverse products that I make and sell at a glance. It was not all plain sailing I have to admit and my apologies to anyone who may have simply been perusing KT Miniatures this morning to find that half my Home Page had disappeared for a while....ooops. Yep, that was purely down to me as I was jiggling and jaggling new links etc....somewhere along the way I managed to mess it up! But a vey big THANK YOU to whoever invented the "Undo" buttons of this world!!! Ok...have to admit that I did not create any new widgets on my ownsome! I did have lots (& lots) have help from my IT Director & better half, aka Mr KT Miniatures. After much pondering and deliberation between us we came up with this.......just hope it works on all your different computers and browsers! A while ago, a colleague persuaded me to make some tiny 1/24th scale printed items for a commission that she was working on. My initial reaction was "oh no...I don't really do 1/24th scale". 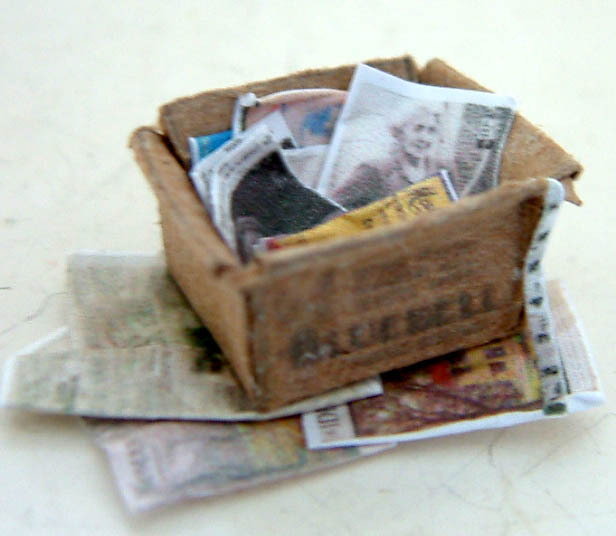 Up until now, I had only really delved into the realms of 1/24th scale with my reproduction lino which currently is a big seller plus did dabble in the distant past with some 1/24th scale printed wartime id cards, newspaper etc. 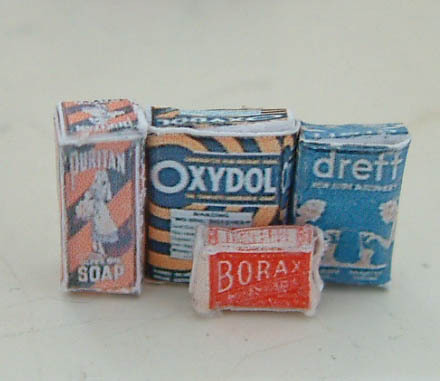 But the smaller wartime printed items never really took off so consequently withdrew them & thought "no.... 1/24th scale is not really for me, I'll just carry on with the lino and stock some antique 1/24th items!" However, my colleague was quite persuasive and I gave it a go. 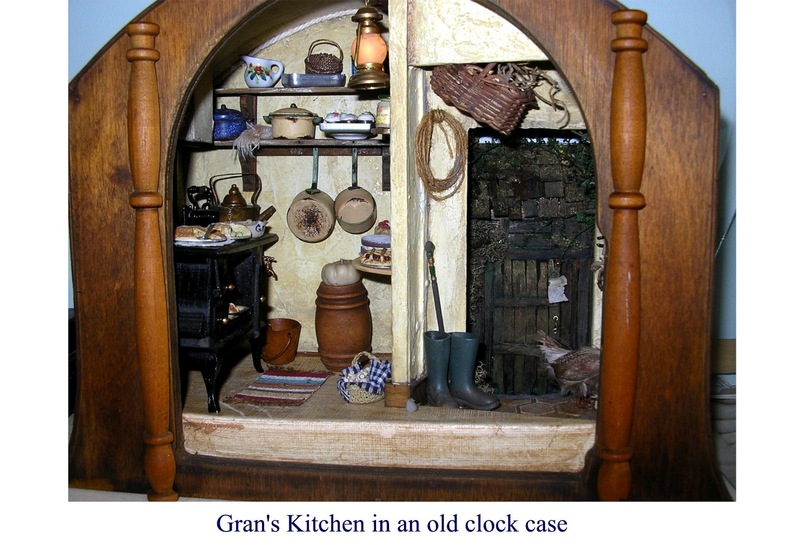 I was so delighted with the results that I decided to make a few replicas of my larger 1/12th scale printed items, mainly from my General & Kitchen range. 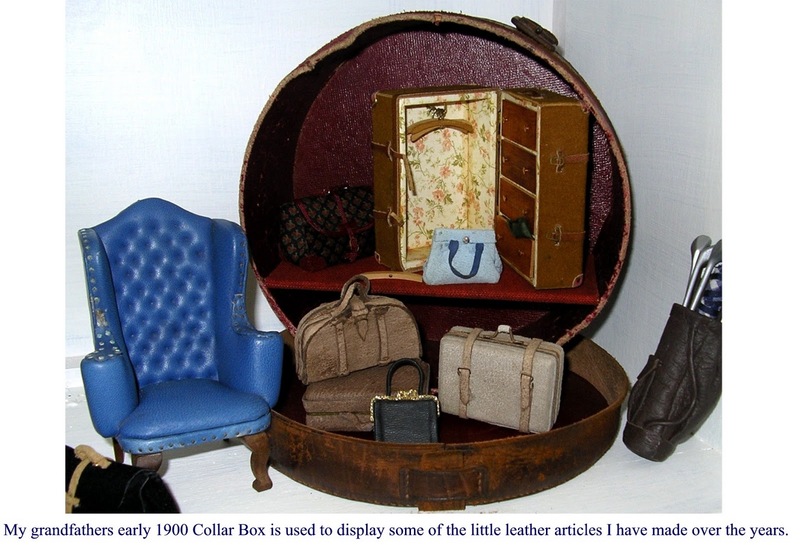 I have to say that this 1/24th scale is much harder to work in than the 1/12th scale but you may be glad to know that I have persevered....and at long last have been able to create a brand new page on KT Miniatures website.....1/24th SCALE handmade 1930s/40s items and hope to broaden the range very shortly. 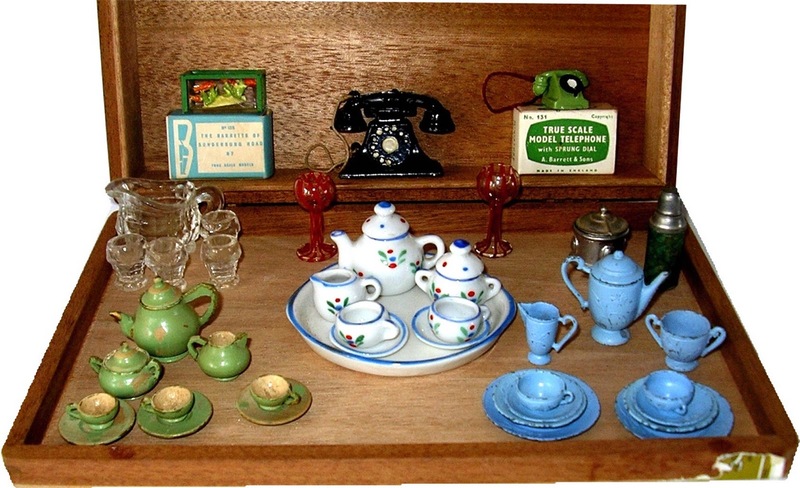 1930s & 1940s Food Packaging fixed sets that can sit on a pantry shelf or cupboard top maybe? 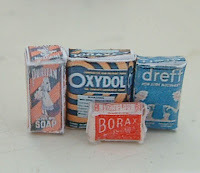 Various cleaning packaging fixed sets that would be suitable for 1930s - 1940s kitchens or sculleries. 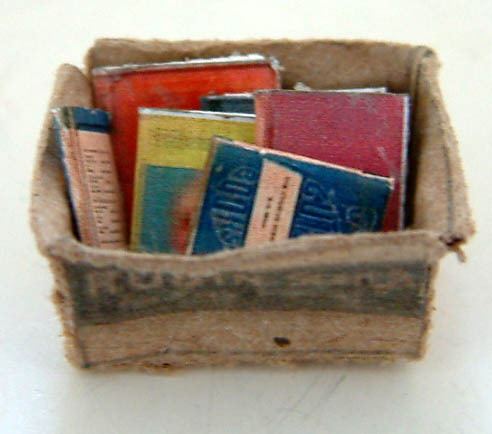 Tiny 1/24th scale replicas of the 1/12th scale KT Miniatures sets of five vintage books. Again, these are all suitable from the 1930s era onwards. 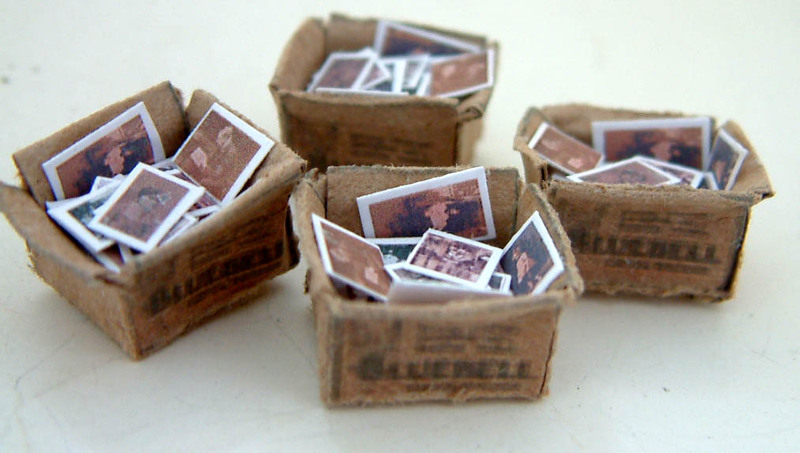 There are also tiny aged printed boxed sets of old photos, old books plus various set pieces of books with old newspapers, magazines etc. ONE TWENTY FOURTH SCALE page. 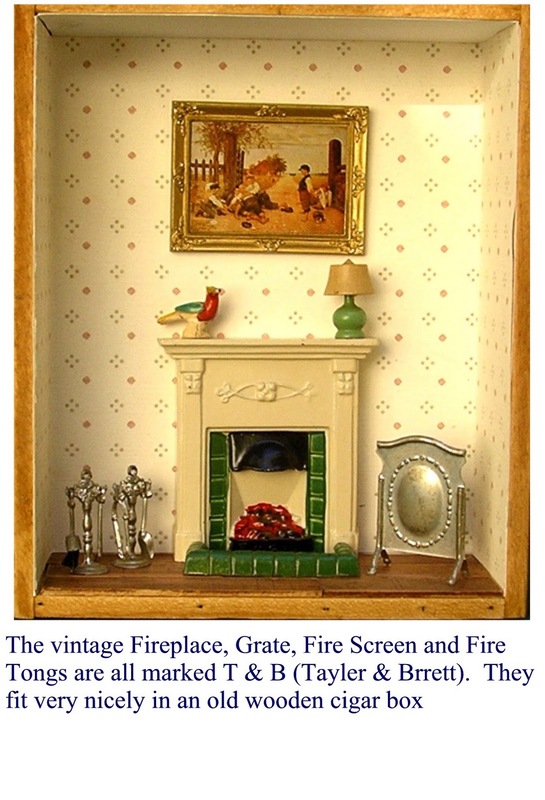 I have had an ANTIQUE ONE TWENTY FOURTH SCALE PAGE too for quite a few years now, although stock on this particular page is quite low at the moment. 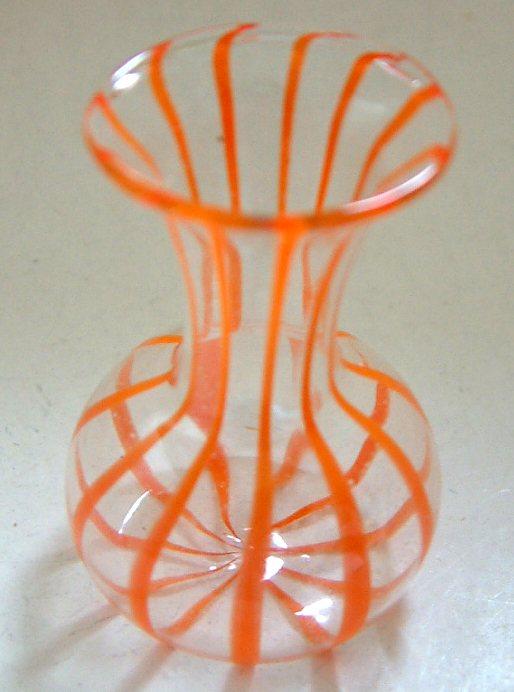 It is worth checking it from time to time as I do get some lovely interesting pieces in. Just listed today on KT Miniatures website, is this lovely circa 1930s Britains Lead Garden Pond & Nymph. This is quite rare and just does not come along very often. To have the nymph too is a bonus however she has been in the wars a little! These lead garden pieces are not everyones cup of tea I know, but I simply love them! 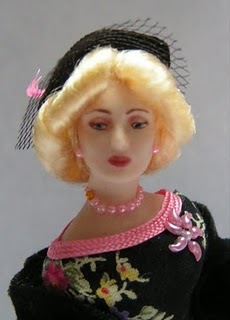 They were made pre-war and for a time post war until the late 1950s when the plastic Britains Floral Garden took over. This pond is most definitely of pre-war origin as it came with a batch of 1930s dolls house furniture. Many a young lady used various components of the lead garden set (the later plastic version too) with their dolls houses. What is also so nice about this particular pond is that it is in excellent condition. I have seen other ponds that have suffered metal fatigue and have been riddled with holes. This one though is perfect (apart from the poor nymph). I also love the muted colouring of the painted finish....is so exquisite. Here you can see a close up of the nymph. 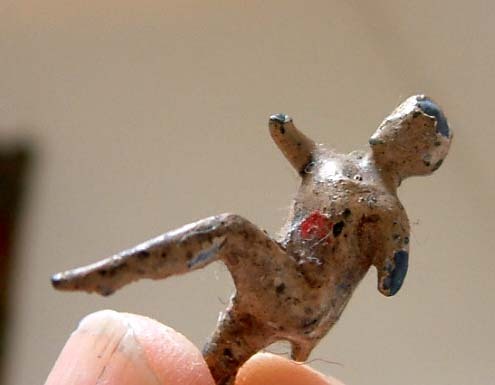 ....she has lost the lower half of her arms and the connecting bit at the bottom of one of her feet that would have slotted into the central hole of the pond. 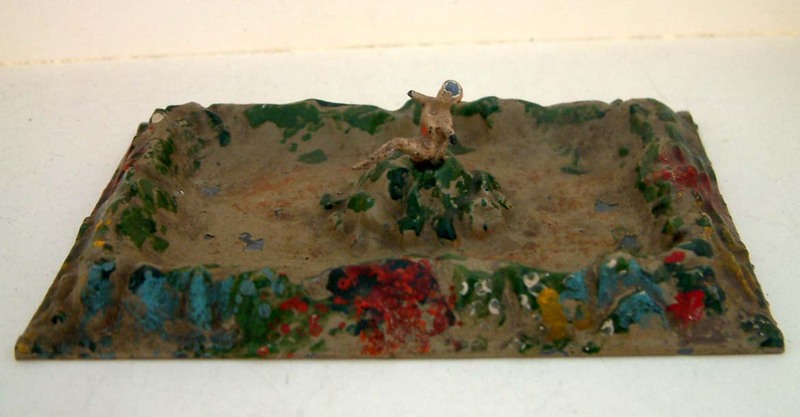 The pond measures 5 1/4" long x 3 1/2" wide so even though the whole Britains Lead Garden set is actually 1/32 scale..........this pond along with all the other garden pieces from the Britains series would look fantastic with a vintage dolls house where scale does not matter. Finally, I thought I would just show you this wonderful circa 1930s Britains lead sundial that came with the pond. Again, it is tiny, standing at just under 1 3/4" high but is lovely and would complement any vintage dolls house. 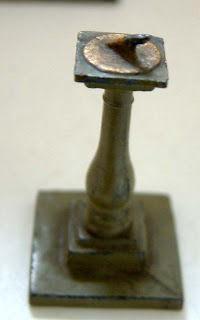 Every so often I come across another artisan who makes miniatures that simply intrigue me and which grab my attention. 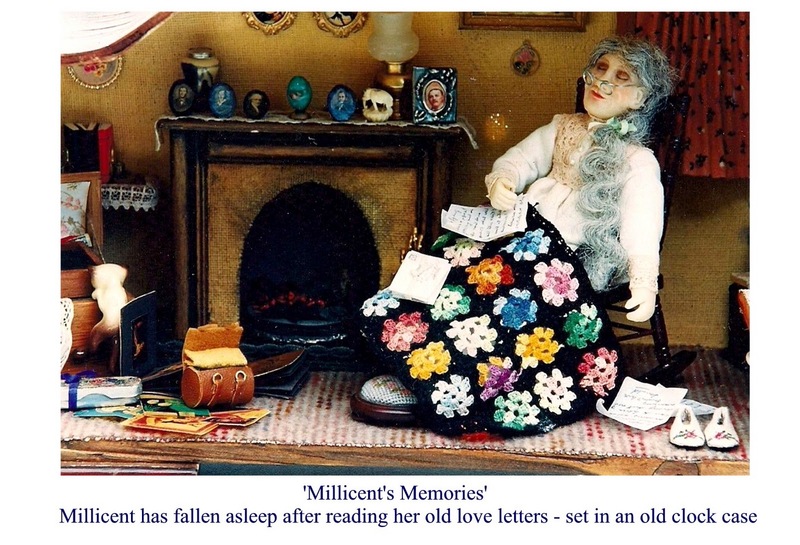 Today on here, I would like to introduce you to one of those artisans....... Mary Williams ( a retired detective would you believe) and her wonderful dolls. ﻿﻿﻿﻿﻿﻿﻿﻿﻿﻿﻿﻿﻿﻿﻿﻿ It was at Thame Fair a week or so ago that I was able to really stop and admire Mary Williams' dolls "in the flesh" for the very first time. Mary's stand was full of an amazing array of her gorgeous porcelain dolls dressed in costumes spanning over several eras. 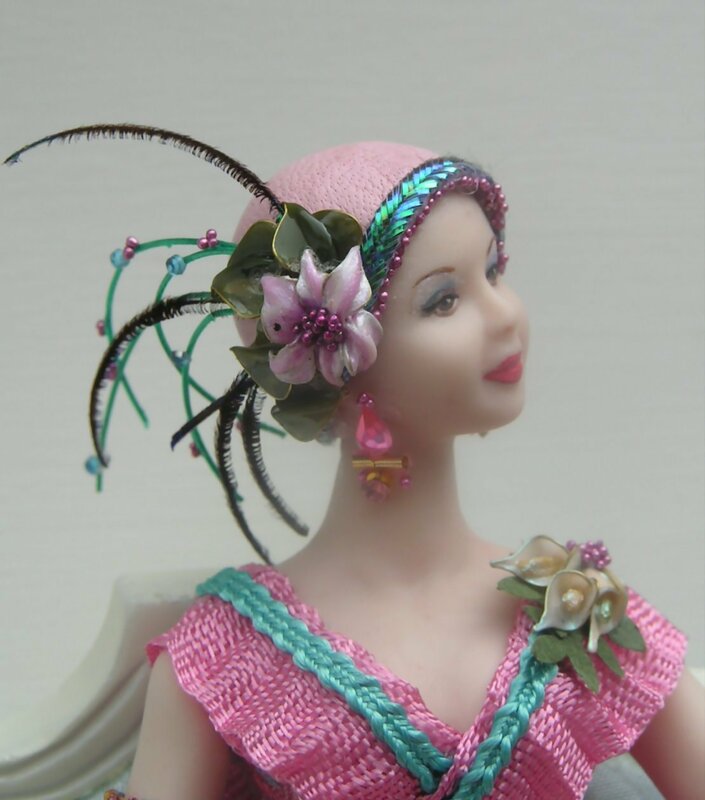 However I have to say that it was the dolls dressed in the art deco and 1930s-1940s costumes that really caught my eye (followers of KT Miniatures won't be surprised as you will know that I am potty on all things 1930s-1940s)! 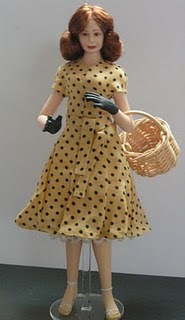 You can see a variety of these 1940s dolls here, all made and dressed by Mary. I am in awe of anyone who has such skills. Her attention to detail on the costuming is just lovely. 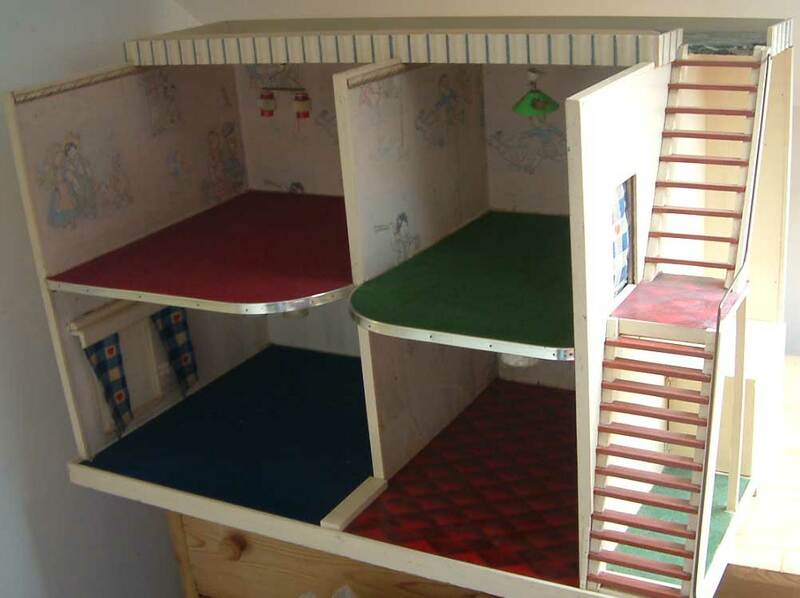 If you have a 1940s style (or even 1930s) dolls house then these dolls would certainly complement your collection. I have to say that the two young ladies as seen in the photo above right, particularly make me chuckle and can just imagine them "Digging For Victory" as the spitfires soar overhead!!!! Finally I know that this is more 1920s but just had to show you this, an art deco doll.........I am sure you will agree that she is absolutely exquisite!!! 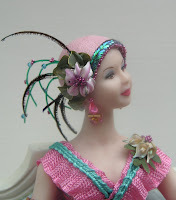 She epitomises everything that a 1920s doll should be and as like with all her other dolls, captures superbly the essence of the era that it represents. 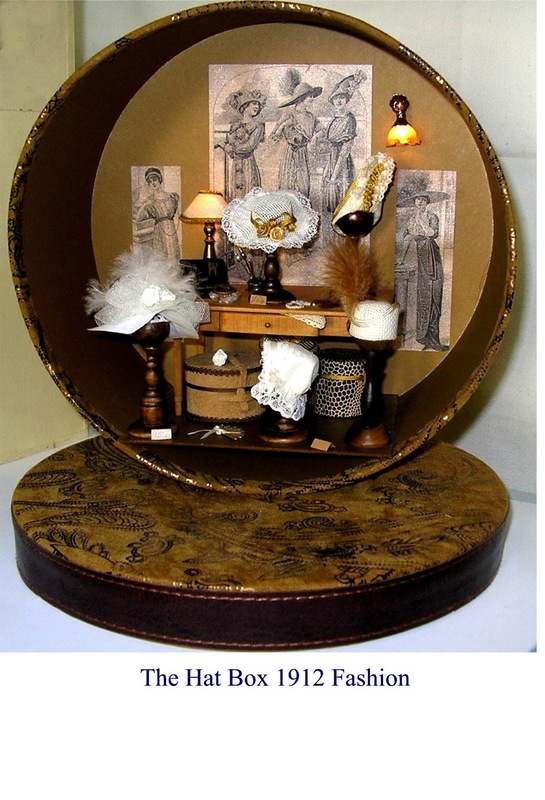 Do go take a peek at Mary's website and see the full extent of Mary's work as she produces dolls in all kinds of period costume and much more!